SLP projects are presently conducting household surveys in 9 different countries. To gather and/or enter those data we are exploring the use of CAPI (computer assisted personal interviewing) to replace paper based interviews. The advantages of CAPI over PAPI (paper and pencil interviewing) are: faster flow of data between enumerators and regional/central offices, skip the entering data process, an improved error-tracking process and reduced use of paper. Yet, several challenges need to be addressed, including: capacity building, acquisition of technological gadgets, battery requirements and establish/use reliable communication channels to transfer information. 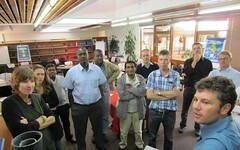 Two main tools have been identified: Surveybe and CSPro. Surveybe is a commercial, very user-friendly software package. CSPro is a public-domain software hosted by US Census Bureau. We want to assess both software packages to see whether they cover our needs. We might not have the resources to implement computerized surveys in all the regions for the present projects. Still, we will try to test it in East Africa and by developing the questionnaire in CSPro, we will be able to use the platform across regions to enter the data gathered on paper in the field. 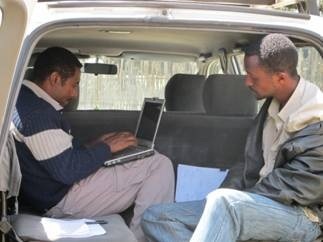 CSPro was tested this week in Ethiopia (see photo below).